Tracking the Impact of Google’s Mobile Overlay Algorithm. On January 10, 2017, Google began rolling out an algorithm that flagged and potentially lowered rankings of mobile pages that show an interstitial to visitors before showing the page content. If your site doesn’t use mobile interstitials for the first click, it still might be impacted in a positive way if competitors lost ranking. Google search traffic varies for all kinds of reasons (search interest, competition, Google search results layout changes, and so on), so how can you know if if your site was potentially impacted (either positively or negatively) by this change? One key metric to look at is ranking changes for unbranded mobile queries. Of course, it’s always possible that rankings changes are coincidental to any specific Google algorithm change, but that’s the nature of organic search metrics. Unbranded queries are queries that aren’t specifically for your site, brand, or product. For instance, for Nike, branded queries would include not only “nike”, but also “nike shoes” and “nike workout clothes”. Unbranded queries would include “shoes” and “workout clothes”. I suggest filtering out branded queries for this metric because Google’s algorithm changes that lower rankings for quality of spam issues often don’t impact branded queries. One reason is that the searcher intent for the brand site is a stronger signal than the quality of the site itself in rankings algorithms. If you look at the average ranking across all queries, the lack of change in branded queries might hide changes in unbranded queries. On the other hand, if you look only at rankings changes for individual queries, you don’t get the bigger picture (a rankings change of only a few queries may not be indicative of larger trends). Looking at data for unbranded queries in aggregate is a good starting point to surfacing trends. If you do find rankings changes, you can further dig into the data by looking at categories of queries. For example, if only “how to” related queries were impacted, you might check to see if Google recently launched an answer onebox that has pushed organic listings down. You also want to filter the data to only queries from mobile devices and to compare that data to desktop query data. If rankings changes happened for both sets of data, then they are likely unrelated to Google’s change. Below are details on how to view these metrics, both in Keylime Toolbox and directly in Google Search Console. Getting the data from Google Search Console directly takes more time (a lot of this is built into Keylime Toolbox automatically) and may not be as granular. But if you don’t use Keylime Toolbox already, you can sign up for a free trial of the Complete Edition and Keylime Toolbox will import 90 days of data. Keylime Toolbox query segments use regular expressions. Every reporting group contains a “branded” segment by default and all reports can automatically be filtered by branded and unbranded queries. 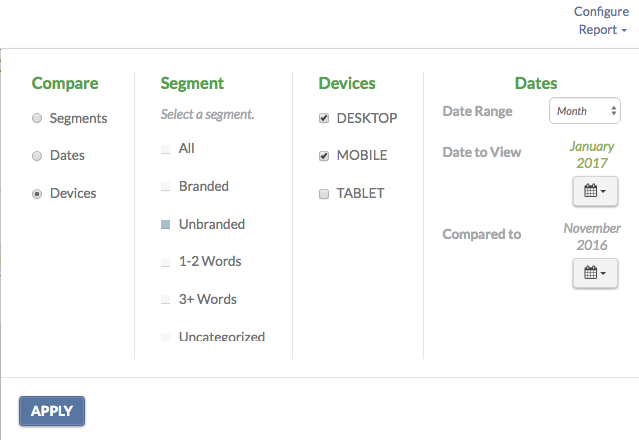 When you set up a Keylime Toolbox account, edit the branded segment pattern to accurately reflect how audiences may search for your brand, including misspellings, acronyms, brand variations, and so on. You can filter all reports to show data for only searches from mobile devices, and with the SEO Trends report, you can compare (ranking, CTR, impressions, and traffic) trends for mobile vs. desktop search. 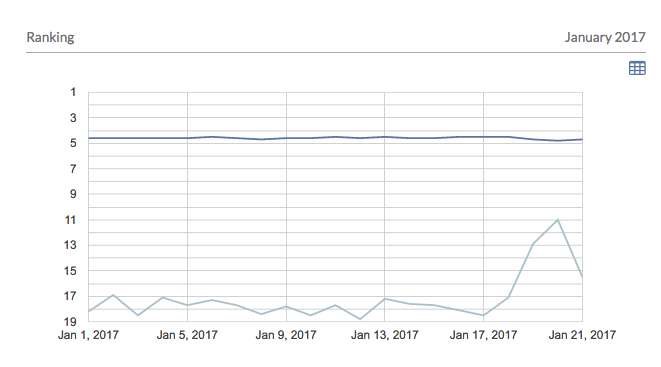 In the example below, you can see that unbranded desktop query rankings are more volatile than their mobile counterparts, but mobile rankings seem to have declined beginning 1/18/17. It’s definitely worth watching to see how the trends continue. Mobile rankings are important to this site mobile searchers send more traffic to the site than desktop searchers. 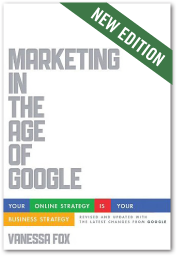 You can further drill into the numbers using the SEO Metrics Overview report. In this case, since the rankings change happened on 1/18/17, you might want to look at just 1/18/17 and newer (which, as of this writing, is 1/20/17). You can do that by clicking Configure Report and then choosing a custom date range. You might want to compare the data to the same range the previous week, month, or year. 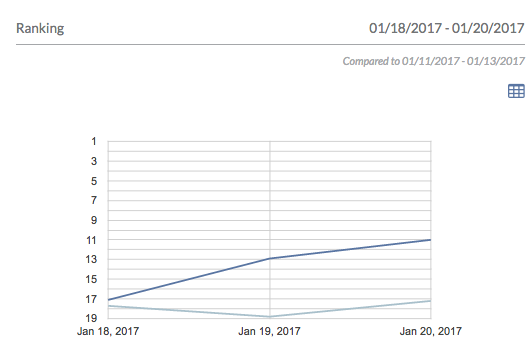 In this case, the reporting group doesn’t have historical data for a year (Keylime Toolbox initially imports the previous 90 days of data then stores data going forward) and the data from the previous month might be anomalous since it was during a holiday season, so we can look at the previous week. To compare rankings of specific queries, download the query data from each date range using the Query Details report and then using Excel to do a vlookup on the data on the Unbranded tab. To compare rankings of a more granularly filtered data set, use the Custom Segmentation Tool to generate an Excel file with a list of queries that match any regular expression pattern you set up. Generate Excel files for the two date ranges you want to compare. To view data for a more a more granular set of queries, create another segment pattern (such as the “how to” example mentioned earlier). The Google Search Console interface provides far fewer individual queries than Keylime Toolbox is able to import via the API, so the more granular analysis will be limited to a top sample of queries, generally under 2,000 (vs. the potentially 1 million of more queries available in Keylime Toolbox). Google Search Console report filtering doesn’t support regular expressions, so if you want to filter graphs to only unbranded queries or to queries that match a particular topic, you’ll be limited by filters that match a single keyword. In the National Park Service example above, you could filter to queries that exclude “national park service”, for example, but not the other variations (such as NPS, National Park Service, and so on). Google Search Console reports only display one search type (web, images, video) at a time, whereas, Keylime Toolbox aggregates search type data. Choose Position as the data to graph (you can enable the other data points as well, but the graph might get noisy). 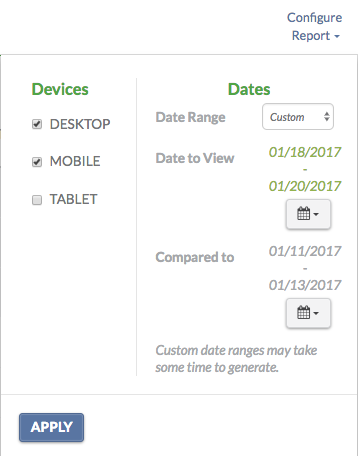 Set the date range – in this case, you can leave it at the default of the last 28 days or can choose a custom range of January 2017. 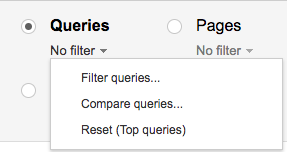 From Queries, select the No filter drop down and then Filter queries. Choose Queries not containing and enter the most common keyword from branded queries. As noted above, this won’t filter out all branded queries, but will exclude many of them. For instance, you could filter out queries containing [national park service], although this won’t exclude queries containing NPS, misspellings, and so on. Click Filter. From Devices, choose the No filter drop down menu and choose Compare Devices. Then choose Desktop vs. Mobile and click Compare. Set the Queries filter as described above. Change the Devices filter to Mobile. Change the Date filter to Compare date ranges (in this example, I’m comparing the previous 7 days with the week before). Don’t see any rankings change? If your site presents mobile interstitials to Google searchers, you should still look at ways to minimize them. Google’s algorithms are always based on numerous factors, and adjust often, so there’s no guarantee this ranking factor won’t impact the site in the future. See rankings declines? Look at ways to minimize mobile interstitials on the first click from Google search results. See rankings improvements? Great! Your site’s pages may have an edge of the competition regarding mobile user experience. Keep this data for reference in case anyone tries to introduce mobile interstitials to the site later. Don’t have Keylime Toolbox? Check out a free trial!